Sato Racing Type1 Lever Guard with 22mm Bar End. Sato Racing Lever Guards help protect your hands and prevent unintentional engagement of the clutch or brake levers, such as during contact with another rider on the track. 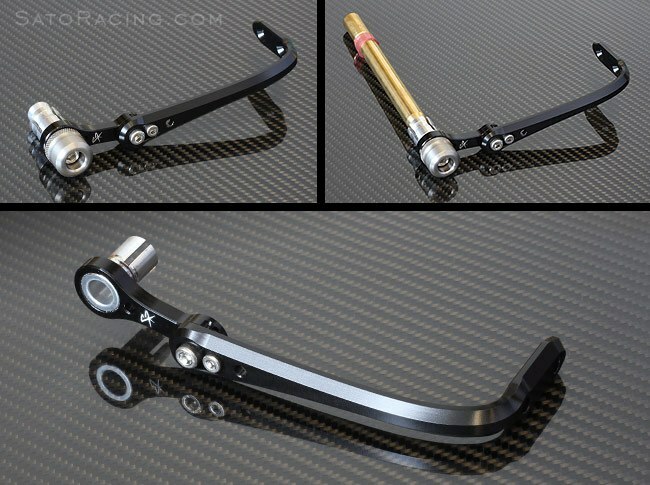 Made of lightweight Black-anodized billet aluminum, these Lever Guards have an adjustable pivot that lets you change the angle of the arm and overall length of the guard. This pivot also allows you to rotate the arm of the Lever Guard, Type1 Lever Guard have a small diameter base and are designed for use with a compact button-style 22mm Handle Bar Ends. Choice of anodized aluminum (Black, Silver, Gold, or Gunmetal), or Stainless Steel Bar End.